One week to go, will Arsenal sign players? Charity shield, Community shield or whatever it is called is complete meaning there is one week to go before the Premiership season starts. A fairly successful run of pre-season games for Arsenal despite not doing the business in front of their home fans the players can look back on their performances as steady and productive. Fitness and confidence was gained and the only dampener so far has been the lack of any signings to keep the first team players on their toes and heighten the chances for silverware. With all due respect to Yaya Sanogo his signing is one of promise and potential rather than one to give Olivier Giroud sleepless nights. The young Frenchman has every chance to stake a claim this season but at present there have been no Marquee names walking through the Emirates stadium doors to give the squad and the fans that little lift going into the opening game. There’s still time for players to be signed before the season starts but there is no time to bed any new players in with a pre-season game to get to know their new team mates. It’s a case of hitting the ground running and maybe Wenger has bided his time because the players he eventually brings in are of quality enough to improve the team without the need to acclimatize or require a run of games. I’m not sure if any other player has been talked about moving to Arsenal so much as Higuain has this summer only for the player to move on elsewhere. The irony of him making his debut against Arsenal for his new club was the icing on the cake. Whether the change in pursuing the player was down to Real Madrid hiking the price or whether Luis Suarez was deemed a far better option only the Manager and his backroom team will know but as it stands the Suarez situation looks just as doomed given Liverpool FC’s stance on the matter. The latest name linked is Luiz Gustavo, it has been alleged that the club are in talks with the player over a £14m move to the Emirates. Great news if true however Arsenal’s summer of the boy who cried wolf is sure to have the fans half lift an eyebrow to such news. With Gervinho gone and now Chamakh’s move to Crystal Palace 99% confirmed it really seems weird to see so many outgoing this summer and no replacements signed as yet. Gustavo could be the defensive midfield cover we have been screaming out for to at least replace the void left by Alex Song however we are still very light at the back and require an attacking alternative to Olivier Giroud. Arsene Wenger does seem to have a vision of a squad that multi-task and fits into other positions when needed, an admirable attribute for a player to have but if a player is covering for another players position then we lose that players contribution in their strongest position. I’m a strong believer in players playing in their strongest position, covering every once in a blue moon but not relying on it constantly throughout a season. There should always be quality cover for every position much like we have at the full back positions each of the four Sagna, Jenkinson, Gibbs and Monreal are as good as 1st choice full-backs in their own right. We need similar strength throughout the squad. One week until season kicks off and another few weeks before the transfer window closes, the timing isn’t ideal but Arsene still has time to turn things around and make his summer business a success. Have a Fantasy Premier League team? why not try your luck in the Gambeano Snitch Fantasy League. Add your team to the league using the following code: 742933-177783 or use the following link. 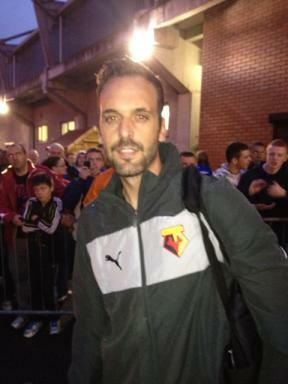 Former goalkeeper Manuel Almunia has found a new club in Watford FC. Our former number one has made the short move across London to sign a one year deal with the hornets. Manuel was one of the high profile free departures from the gunners at the end of last season and most gunners will join me in wishing the Spaniard well at his new club. At least Almunia’s departure was a smooth one and hopefully he won’t have any bad words for the gunners once he has his interviews and settled in at vicarage road. A number of players at the club have been dragging their feet upon leaving the club despite declaring their intentions to leave the club a while back now. Players that fall into that bracket are Denilson and Niklas Bendtner, although Denilson managed to engineer another season loan at Sao Paulo a clean break from the club would have been a more feasible arrangement for all. The manager’s door was hardly being knocked on repeatedly full of prospective offers and Arsenal in the end were forced to succumb to Sao Paulo’s terms. Bendtner another player on his way out is hardly trying his best to attract the masses, the big Dane was fined by the courts after a non-appearance to answer charges of driving without a valid driving license. He apparently chose to go on a shopping spree rather than turn up at court yesterday. Its such petulant behaviour that tarnishes the strikers reputation, he is starting to be known for a number of pointless misdemeanours and needs to get his head together and make his football be the only thing people talk about, well… the good points of his football be talked about. At the moment the news of an imminent move has not exactly been filtering through. Though he will eventually move on it seems quite clear the big clubs around Europe he believed would be his destination are yet to be convinced of his star quality. Maroune Chamakh has been linked to Besiktas in Turkey, their manager Samet Aybaba has gone on record to say that he has targeted the Moroccan and Tucay Sanli as the players he would like to lead their attack in the coming season. No comment has so far been released by Chamakh himself so it is not known if the admiration for the striker is mutual. He has previously gone on record to express his happiness at arsenal and his determination to succeed at the emirates this season. I don’t think many gooners would be too distraught if the striker made the move. He will find it hard to win back the belief from the arsenal fans who have noticed his progress move in a backwards direction ever since he lost the snood. With new signings Giroud and Podolski in the mix opportunities will be limited for the striker, Van Persie will be gone so there’s no need mentioning him in the equation. According to the Daily Mail Arsene Wenger has refused to rule out the possibility of Andrei Arshavin staying with the gunners next season. he admitted he could have talks with the Russian this week about his future. 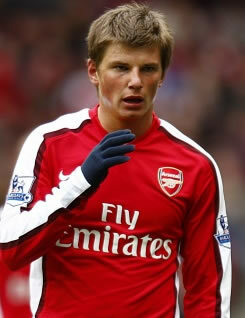 Arshavin staying would be no bad thing for the Arsenal, on his day he can be unplayable and his performances at the recent Euro 2012 tournament showed how effective he can be when played the right way. Its down to the player himself I guess; if he wants to try to make it work this year. Bridges appear to have been burnt with Zenit St Petersburg after his comments received negative press in Russia after a defeat in the Euros. I’d be happy for him to stay as our squad still requires strengthening and as the season draws closer no signings look a possibility apart from potentially Santi Cazorla.